The free men of America did not wait till usurped power had strengthened itself by exercise, and entangled the question in precedents. They saw all the consequences in the principle, and they avoided the consequences by denying the principle. We revere this lesson too much soon to forget it. Who does not see that the same authority which can establish Christianity, in exclusion of all other Religions, may establish with the same ease any particular sect of Christians, in exclusion of all other Sects? that the same authority which can force a citizen to contribute three pence only of his property for the support of any one establishment, may force him to conform to any other establishment in all cases whatsoever? Because finally, “the equal right of every citizen to the free exercise of his religion according to the dictates of conscience” is held by the same tenure with all his other rights. 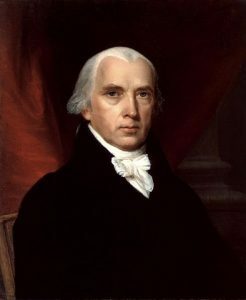 If we recur to its origin, it is equally the gift of nature; if we weigh its importance, it cannot be less dear to us; if we consider the “Declaration of those rights which pertain to the good people of Virginia, as the basis and foundation of government,” it is enumerated with equal solemnity, or rather studied emphasis.